Every job we do is our best one yet. Whether you need a single unit or a large-scale installation, Compressor Systems (West) Ltd. has the knowledge, equipment and experience to deliver exactly what you need. We have our own design staff to help you plan and design a system that’s right for your business. And because we professionally install what we design, we maintain direct control over the quality of the finished system. To ensure that an air compressor plant and its ancillary equipment operate efficiently, each system must be designed to use the most suitable materials. 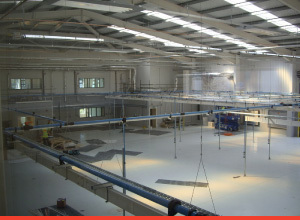 We specialise in plant room installations and regularly use galvanised or welded stainless steel tubing. For factory-wide distribution, we also recommend Legris Transair aluminium and stainless steel pipe work systems. The advantage of Legris Transair piping is that it is lightweight, durable and quick to install. It’s also easy to modify if you need to add a new drop or bypass to your system in the future.